Visual Studio Code>Programming Languages>Fatshark DebuggerNew to Visual Studio Code? Get it now. Extension to debug Fatshark applications and games. 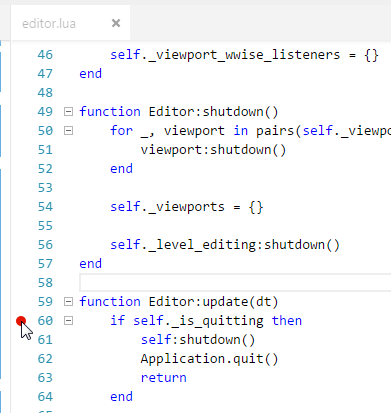 This extension makes Visual Studio Code into a full-featured code editing debugging environment for your Fatshark projects. You can connect the debugger to a running engine, launch a project, trigger breakpoints and step through your project's Lua code, view variable values, send commands to the engine, and more. This extension is based on a fork of the Autodesk Interactive Debugger developed by Jonathan Schmidt. Bring up the Extensions view by clicking the Extensions icon in the Activity Bar on the left side of Visual Studio Code, or selecting View > Extensions (Ctrl+Shift+X) from the main menu. For more about installing extensions, see the Visual Studio Code user guide. Open your Fatshark project folder in Visual Studio Code. This will be your workspace, where Visual Studio Code will keep your debug configurations. Select File > Open Folder (Ctrl+K Ctrl+O) from the main menu, and browse to the folder that contains your project's .stingray_project file. You can make any folder on your computer your workspace, but using your project's resources folder has the advantage of keeping your debug configurations together with the project that you'll be using them with. It also makes the Lua files in your project easy to get to in the editor while you're working. A debug configuration tells the Visual Studio Code debugger what it should do when you start debugging: whether it connect to a running process or launch a new process, and what settings and parameters it should use for the connection. You can read some background about these configs here. You'll have to create at least one new debug configuration in order to make the debugger able to attach to or launch the engine. Bring up the Debug view by clicking the Debug icon in the Activity Bar on the left side of Visual Studio Code, or by selecting View > Debug (Ctrl+Shift+D) from the main menu. Choose Stingray. You'll get a new file called launch.json, pre-set with a default configuration. See the following sections for details on how to set up the parameters. Each configuration that you set up in this file will be accessible by name in the drop-down list at the top of the Debug view, so that you can quickly select the configuration you want to use each time you start debugging. // Standard Visual Studio debugger parameters. "request": "attach", // Use attach here to make the debugger connect to an existing process. // The IP address of the device running the stingray engine. // The port the engine is using for console communications. If you launched the engine using the editor's Test Level feature, use 14000. If you launched the engine on Windows using the editor's Run Project feature, or by running a deployed project (with the dev configuration), the engine chooses a free port between 14000 and 14030 inclusive. This means that you might not have the same port number every time you run. To specify a pre-set port number when you launch the engine, you can use the --port <number> command-line parameter. Tip: to specify a port when you use the editor's Run Project feature, add the --port <number> command-line parameter to the default localhost connection listed in the toolcenter. You can also connect to the instance engine that the editor runs internally. This can be useful in order to debug the Lua code in the core/editor_slave folder, which provides viewport behaviors for the editor. For engines running on most non-Windows platforms, use 14030. For Xbox 360, use 4601. You can make the Visual Studio Code debugger launch the Autodesk Interactive engine with a specific project, and immediately attach itself to that instance of the engine. The engine will wait for the debugger to connect and start the debugging session before it runs any Lua initialization code. "request": "launch",  // Use launch here to start a new process. // Folder where Stingray is installed. // Full path to the project you want to launch for debugging. // Recompile any modified resources in the project before launching. // Optional command line arguments you would like to pass to the engine. // Run the game using DirectX 11. // Specifies the dimensions of the engine main window. You don't have to provide any command-line parameters. The debugger extension will set the ones it needs, like --port and --data-dir. But you can add your own if you want to customize something about the way the engine starts up. In the Debug view, choose the debug configuration you want to use from the drop-down list. If the debugger is able to connect to the game, it will show the Debug actions pane. You should now be able to open your project or editor script files and set up some breakpoints. Inspect the values of your local Lua varibles in the Variables list, or by hovering over the variables in the code editing window. Use the Call stack to navigate back up through the trail of functions that are currently in progress. Use the Debug actions pane to control the engine. For example, you can resume code execution until the next breakpoint is hit, or you can step forward through the evaluation of your code line-by-line. Whenever you step in to a function located in a new file, Visual Studio Code will automatically open the file for you. The restart button in the Debug actions pane reboots the engine. This reloads and refreshes all resources, and restarts the game. If you place a breakpoint in the project's initialization code, the debugger should break into it when you restart. If any of those messages contain ID strings known to the engine (e.g. #ID[xxxxxxxx]), the extension will try to resolve them to their original string values. You can also send commands from the Command Palette. Open the Command Palette, type Stingray Command and hit Enter. Then, enter the command you want to send (without the -- prefix). Everything that you type in the Debug Console that is not prefixed with -- will be sent to the engine as a Lua script. The engine will evaluate this script in its Lua environment and print the return value. 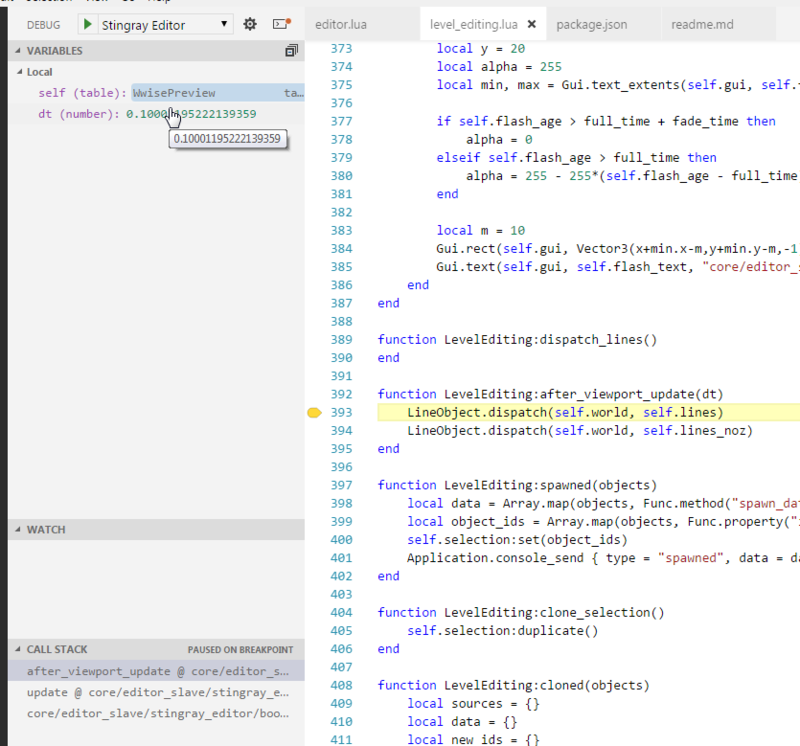 This extension does more than just debugging: it also adds some extra features to the code editor that you'll find especially handy when you work with Autodesk Interactive projects. 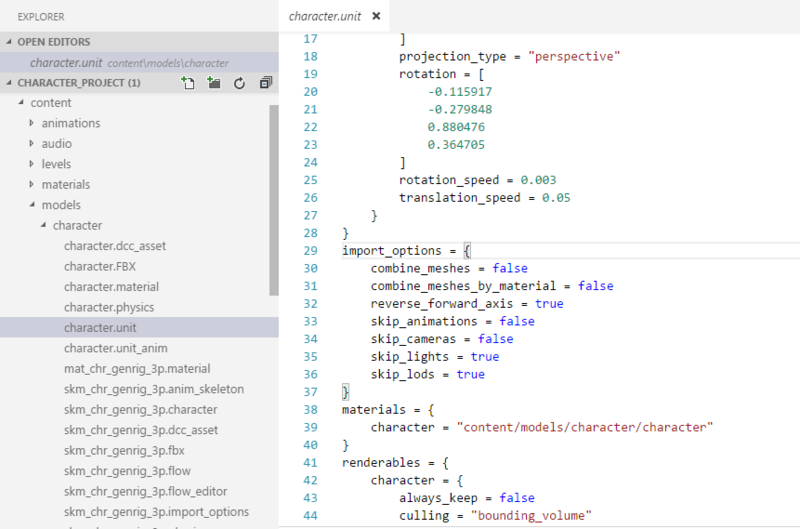 The code editor shows appropriate syntax highlighting for Autodesk Interactive resource types that use [SJSON format], like .unit, .level, and .script_flow_nodes.